Four teenagers stand accused of robbing and murdering an 87-year-old World War II veteran, Lawrence E. “Shine” Thornton, in his driveway in Greenville, Mississippi. On October 18th, police state that assailants pushed Thornton to the ground in front of his home and stole his wallet. He was airlifted to the hospital and died two days later on Sunday morning. Leslie Litt, 18, Geblonski Murray, 18, Terrance Morgan, 19, and Edward Johnson, 19, were charged with capital murder, robbery, and conspiracy to commit robbery. If convicted, they could face the death penalty. They are being held with bond set between $2 and $3 million. Not only was Thornton a true American hero, but he was a star in his local community. He was a veteran of World War II where he served in the Pacific Theater for two years as a Fireman First Class aboard the minesweeper, the USS Herald. Thornton was well known in the Delta region for his Maria’s Famous Hot Tamales, which he began cooking in 1984, and named for his wife, Mary. He won many awards for his hot tamales through the years and loved sharing them with others. He was featured in numerous publications and videos about hot tamales and was interviewed in 2005 for the Mississippi Hot Tamale Trail. 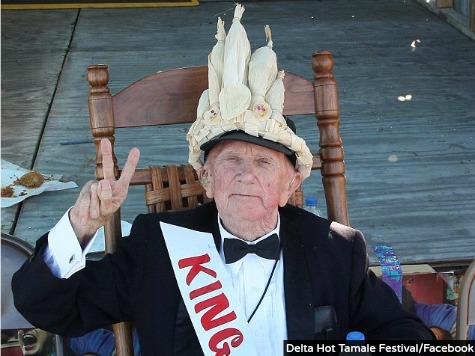 In 2012, he was crowned king of the inaugural Delta Hot Tamale Festival. He was an electrician and owned a liquor store to support his family. His nickname came from a high school incident when he picked out notes from the song “You Are My Sunshine” during a break in a performance. His obituary also said he remained upbeat and happy in old age and would play the fiddle for guests or talk to customers. Thornton was very active at St. Joseph’s Catholic Church. He was a communicant and a Fourth Degree Knight with the Knights of Columbus.